In his Geographica of 23 AD, the encyclopedia written in Greek by the Roman Strabo, the author writes of the priestesses of the Cimbri, a Germanic tribe located in what is now Denmark. "Their wives," he writes, "who would accompany them on their expeditions, were attended by priestesses who were seers; these were grey-haired, clad in white, with flaxen cloaks fastened on with clasps, girt with girdles of bronze, and bare-footed; now sword in hand these priestesses would meet with the prisoners of war throughout the camp, and having first crowned them with wreaths would lead them to a brazen vessel of about twenty amphorae; and they had a raised platform which the priestess would mount, and then, bending over the kettle, would cut the throat of each prisoner after he had been lifted up; and from the blood that poured forth into the vessel some of the priestesses would draw a prophecy, while still others would split open the body and from an inspection of the entrails would utter a prophecy of victory for their own people; and during the battles they would beat on the hides that were stretched over the wicker-bodies of the wagons and in this way produce an unearthly noise." There is further historical evidence of these ritual leaders. The Arab writer Ibn Fadlan described a viking funeral rite that he witnessed in 921 AD on the shore of the Volga River in Russia. He writes of the "Angel of Death" who presides over the proceedings, including the killing of a young slave girl who is burned with the dead chieftain. The older woman is "in charge of the whole ceremony, from the dressing of the cadaver to the execution of the slave." She was "a strapping woman, massively built and austere of countenance." When the final moments come, "the men began to beat their shields with wooden sticks, to stifle the cries of the slave girl, so that other girls would not take fright and refuse to die with their masters." This noise-making echoes that of the Cimbri priestesses almost a thousand years earlier. The grisly ritual reaches its climax when the men involved in the ceremony "made her lie at the side of her dead master. Two held her hands and two her feet, and the Angel of Death wound a noose around her neck ending in a knot at both ends which she placed in the hands of two men, for them to pull. She then advanced with a broad-bladed dagger which she plunged repeatedly between the ribs of the girl while the men strangled her until she was dead." The role of the Germanic priestess either changed over time, was different in different tribes, or had a complex makeup that included both prophecy from the high-seat and a leadership role in ritual sacrifice. Ibn Fadlan worked with an interpreter, and it seems clear that his "Angel of Death" is the same as the Norse "chooser of the slain." In 1014, the Anglo-Saxon bishop named Wulfstan published his Sermo Lupi ad Anglos ("Sermon of the Wolf to the English"). In a time-honored tradition that continues to this day, he blamed a great calamity (in this case, thirty years of viking raids) on his own country's lack of moral fiber. He lists a catalog of the most grievous types of sinners that surrounded him, including "wiccan and wælcyrian" – witches and valkyries. This is not a mystical list of devils, but a human list that includes murderers and robbers. Evidently, there were still active wise women and prophetesses at this late date. These women were, for obvious reasons, bloody and terrifying. It is understandable that whispered tales would grow up around them, especially given the idea in Germanic society that women had mysterious powers to begin with. This gave rise to the mythological concept of the valkyrie as magical maiden that flies above the battlefield, choosing the slain in a mystic sense by marking certain warriors for death in battle. The earthly woman who chooses those who are to be sacrificed evolved into the heavenly war-maiden who magically marks those who are doomed to die on the battlefield. The physical appearance of the original human figures – cloaked, wearing a girdle of bronze, and carrying a sword – is replicated in the mythological descriptions of the warrior-goddesses. 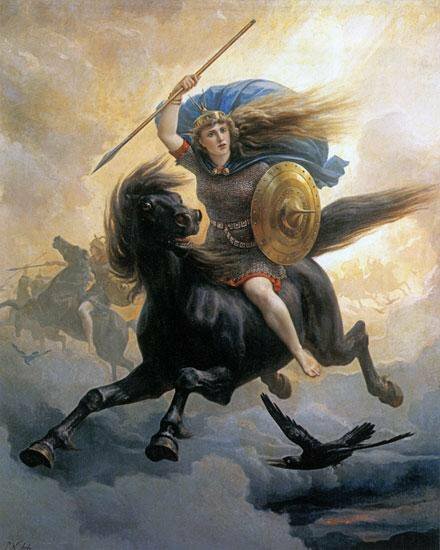 Freya in her falcon cloak can be seen as a super-valkyrie, as a primal version of the horse-riding warrior goddesses of the late mythology.